An accomplished performer and educator, Denise Tryon is a native of Roseville, MN, and has served as Horn Professor at the Peabody Conservatory in Baltimore since 2007. Previously, Tryon was fourth horn of the Philadelphia Orchestra (2009-17). She has also held positions with the Detroit (2003-09), Baltimore (2000-03), Columbus (1998-2000) and New World (1995-98) Symphonies as well as participated in the Colorado Music Festival and the Pacific Music Festival. A celebrated solo performer, Tryon has performed recitals in Sweden, Norway, Poland, Japan, Canada and the United States. In 1989 Tryon graduated from the famed Interlochen Arts Academy and in 1993 received her Bachelor of Music degree from the New England Conservatory of Music (NEC) in Boston. She received the Presidential Scholarship while in the Artist Diploma Program at NEC with the Taiyo Wind Quintet, which won the Coleman Chamber Competition and worked with renowned composers such as Luciano Berio, Elliott Carter, John Harbison and György Ligeti. Tryon released her debut solo album, SO•LOW, in 2015. As a part of this album, she commissioned four new pieces for low horn and piano. A review by Gramophone Magazine observed, “Tryon plays these works with sonorous fluidity and dexterity, ending with a bit of captivating acrobatics.” SO•LOW received a Global Music Award, Bronze Medal. In 2009 Tryon founded yearly horn seminar Audition Mode with Karl Pituch. In 2010 she was an International Horn Society (IHS) Northeast Workshop Featured Artist. 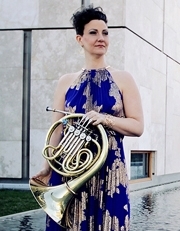 She was a contributing artist at the IHS Symposium in San Francisco in 2011, as well as one of the Solo Artists at the Nordic Hornfest in Norway in 2012. Tryon was on the horn faculty at BIBA (Blekinge International Brass Academy) in Sweden in 2013. She has been the Featured Artist at the Warsaw Horn Workshops in 2013, 2015 and 2016. Tryon was a Featured Artist at the IHS MidNorth Horn Workshop in 2014 and 2016, and in 2015 she was a Featured Artist at the IHS Symposium in LA. In 2016, Tryon was on faculty during the brass weeks at Domaine Forget. Tryon was the Featured Artist at the IHS NorthWest Horn Workshop in 2017.